President Obama’s Great Great Great Grandfather, (Mr. Falmouth Kearney), hailed from the village of Moneygall in County Offaly. See photographs below. 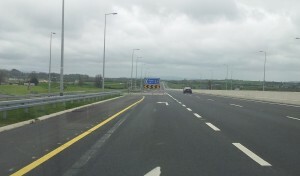 But the adjacent junction on the M7 motorway needs to be treated with caution. Beware of the off ramps. 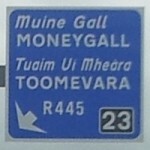 I recently travelled through Moneygall on my way to Borrisokane, County Tipperary. 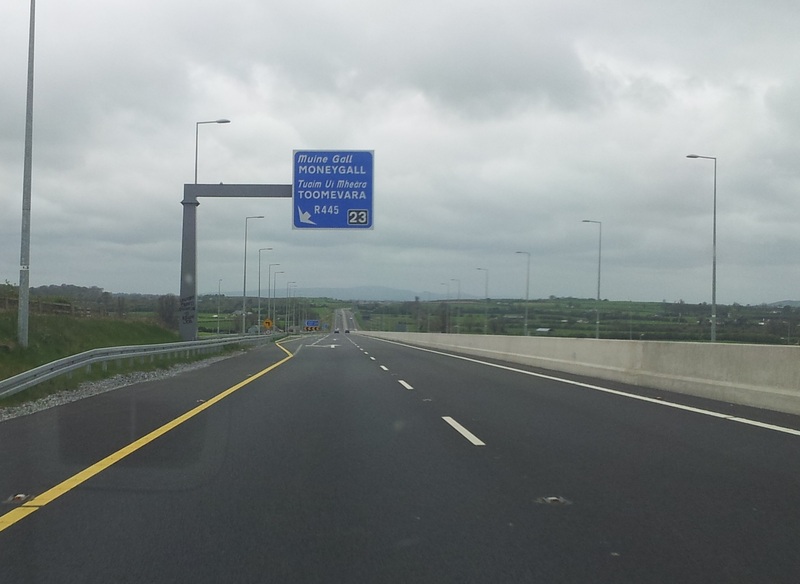 The new M7 motorway certainly makes the trip easier, but the Moneygall off-ramp turn is very sharp. It is virtually a 90 degree turn which needs to be negotiated at slow speed. The junction is on a down slope section of the motorway for vehicles travelling South bound and this makes it more difficult to reduce speed. It could be a hazard for drivers who are unfamiliar with the road. It would be especially difficult for a heavily loaded truck during icy weather. 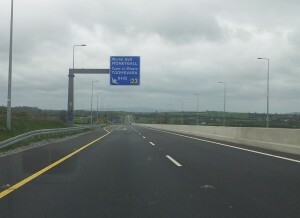 Joining the motorway, Northbound. The other implication of the motorways steep gradient at this junction is that when a driver rejoins the motorway, from Moneygall, going north bound (towards Dublin), it is difficult to accelerate to match the speed of the traffic already on the motorway. The acceleration lane has not been lengthened to assist this. Again heavily loaded trucks might find this especially difficult. 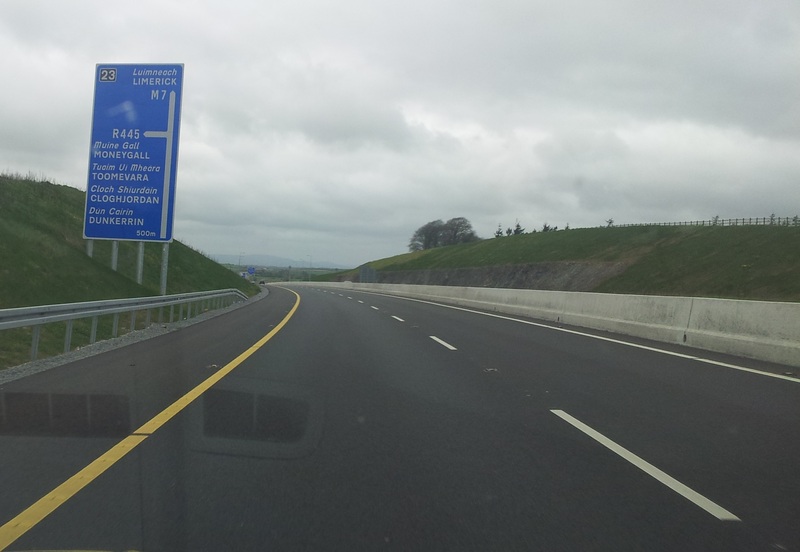 Another problem with this junction is that it and the Roscrea junction are the only ones on the M7 motorway with sharp exits. 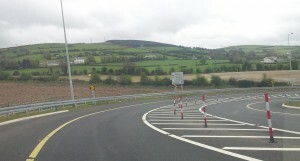 All the others have slight turns and therefore drivers would be expecting similar exits throughout. 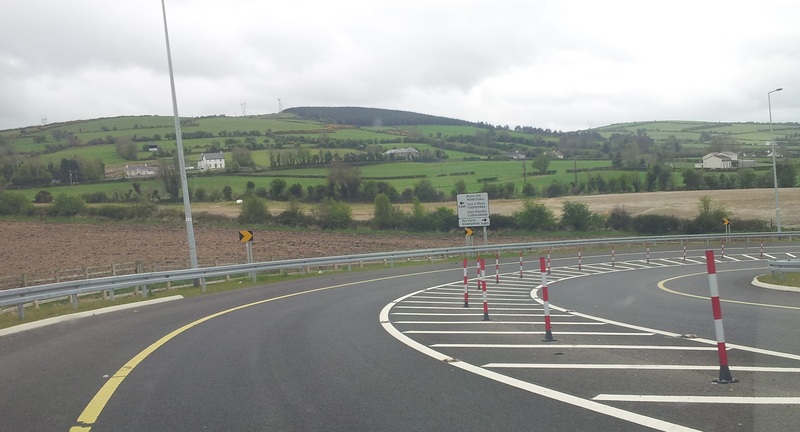 I am unsure why the Moneygall turnoff is so tight, as there seems to be plenty of space alongside to accommodate a longer turn radii. Solutions. An economic and quick solution to this situation would be for warning signs to be installed for drivers, along with remarking the acceleration and deceleration lanes to make them longer. 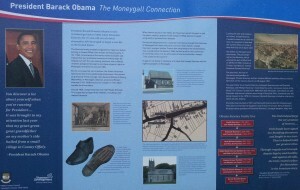 I have included some photographs of the Village of Moneygall alone with the public sign showing the Irish side of the family tree of President Obama. 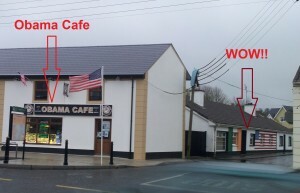 The village is located in the south of Ireland and is making the most of its connection with Obama. 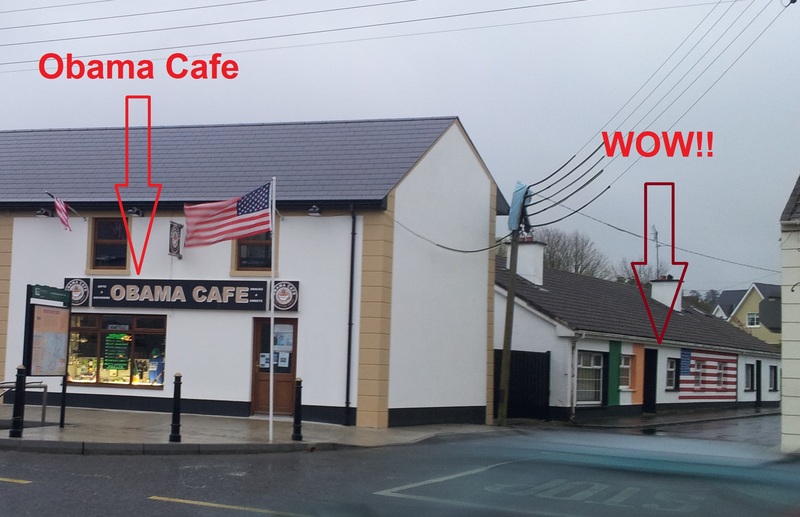 There are Irish and US flags flying from flag polls along the main street, a new Obama café has opened and one resident has even painted a huge Irish and American flag on his front wall, they are obliviously a big fan. 4. 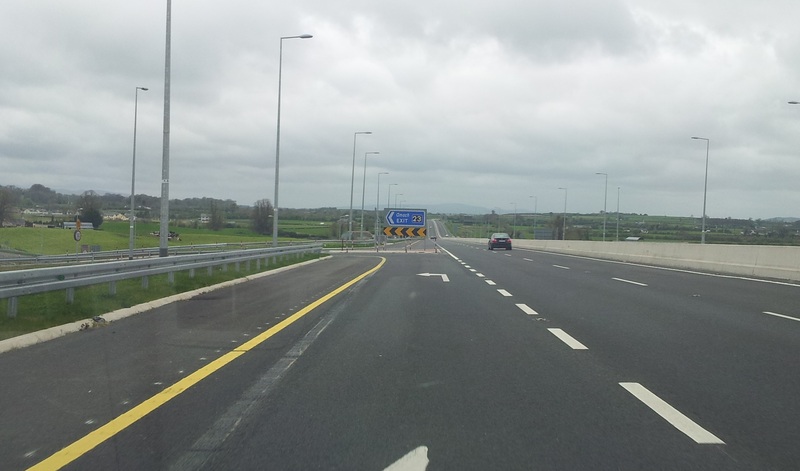 Off ramp at Moneygall….hang on.